I have never had a flu shot and don’t plan on getting one in the future. If I’ve ever had the flu, it was so mild, I didn’t know I had it. Every year we get the official flu vaccine media blitz from the Department of Health and Human Services (HHS) and the Center for Disease Control and Prevention (CDC). The CDC oversees a National Immunization Program (NIP) and their motto is: "Leading the way to healthy lives." I have always wondered (and you should too) why these officials are not urging U.S. citizens to take vitamin C, fish oil, vinegar, grass fed meats and herbal supplements that have been shown to help reduce the risk of illness. It's simple, NIP has millions of vaccine units to move. HHS and CDC officials usually say that the elderly, infants, people with chronic health problems and health workers should all get vaccinated. But when plenty of flu shots are available, health officials recommend that everyone gets a shot. 1. Flu shots are not reliably effective. 2. 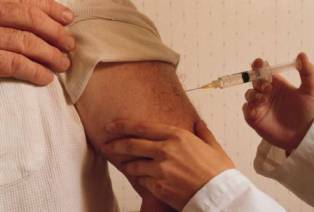 Flu shots contain additives you may not want in your body. In addition to strains of dead flu virus, each shot contains: Thimerosal (a mercury derivative added as a preservative), formaldehyde (to kill viruses), Aluminum (to promote antibody response), and ethylene glycol (also known as antifreeze, used in vaccines as a disinfectant). The FluMist nasal spray vaccine (which avoids an injection) is much more expensive than a flu shot and it contains living flu virus. 3. The flu shot is allegedly designed to strengthen the immune system to fight specific virus strains, but you can strengthen your immune system without toxic injections. Here are some tips from my website: The Natural Way is the Path to Health. As a final point, I don’t take any “medicine” on a regular basis. For more information, see Mercola.com and type "flu shot" in the search box. To learn more on how to live a more Natural Organic lifestyle, go to Health & Lifestyles on DirtDoctor.com. for the free Dirt Doctor Weekly Newsletter. DIRT publication, you can Join the Ground Crew.